My mother makes this snack/dessert when she finds a great pumpkin. Her criteria for picking a pumpkin is that the flesh has to be very dense to the point where it's hard to remove the cutting knife from the pumpkin because there was no air space. 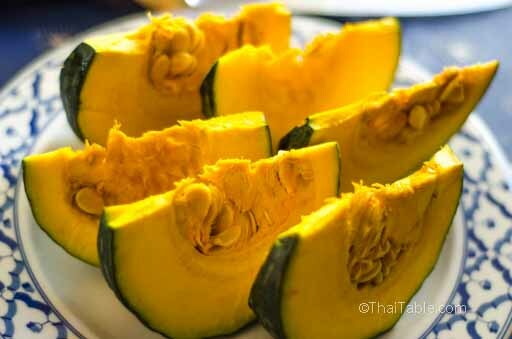 In Thailand, a vendor would gladly cut up a wedge of pumpkin to show you how great it is. This pumpkin is gummy not fluffy when cooked. The mouth feel should be creamy and nutty. And when you have such a great pumpkin, it's the star of the show. Let the steamed pumpkin cool to get a dense and gummy texture. For the leftover pumpkin, kabocha pumpkins make great pumpkin pies. This pumpkin is about 5 inch in diameter and it has about 10-12 sections. It weighs 1 ½ lbs. Rinse the pumpkin well and scrub the dirt off from the skin. Use a large chef's knife, starting by pushing the sharp tip into the pumpkin right next to the stem. Push the handle down along the groove all the way to the other end. Pull the knife out slowly and carefully. Move to the next groove and push the tip end of the knife into the pumpkin. Push it all the way to the other end to meet the first cut. Insert the knife tip into the pumpkin next to the stem to loosen the pumpkin wedge. Use the same technique to cut more pumpkin wedges. 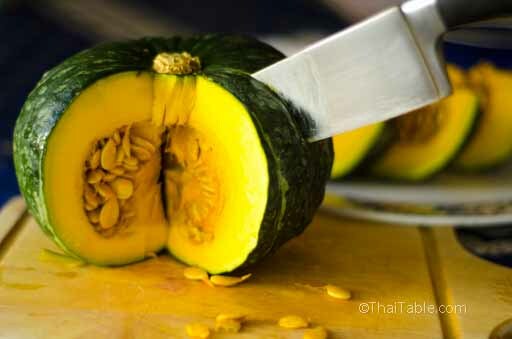 Remove the seeds and pulp by placing the pumpkin skin side down, run the knife along the inside. 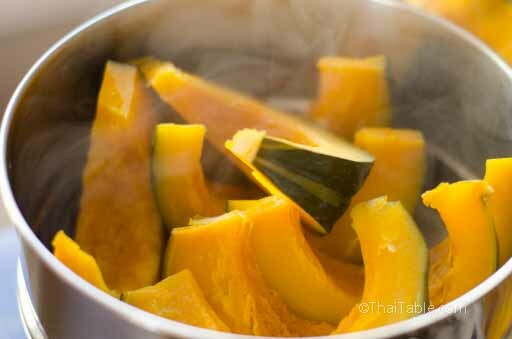 Steam the pumpkin pieces for 10-15 minutes depending on the size of your steamer and the pumpkin. Check for doneness by pushing a tip of a knife into the pumpkin. When it's ready, you should be able to insert the knife easily. However, you don't want to over cook the pumpkin because it will lose the gumminess mouth feel and may fall apart. I'd recommend to turn off the heat when it is just cooked and keep the lid closed until you want to serve the pumpkin. 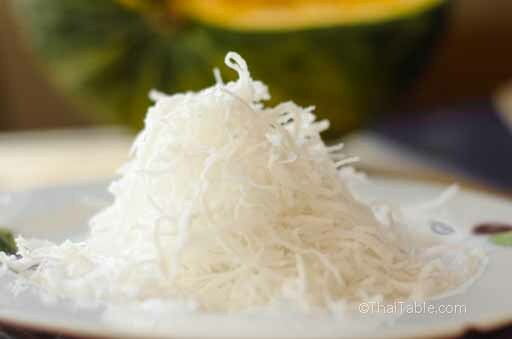 Seasoning the Shredded Coconut: Add a pinch of salt to the coconut and mix well. If you use frozen shredded coconut, thaw the coconut on the counter or in microwave (½ a minute) and fluff the coconut before adding the salt. 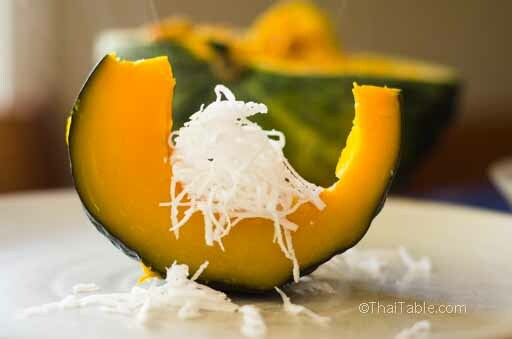 Plate the pumpkin with the shredded coconut on top. Serve warm or room temperature.